NEW! JUST RELEASED & READY TO SHIP! 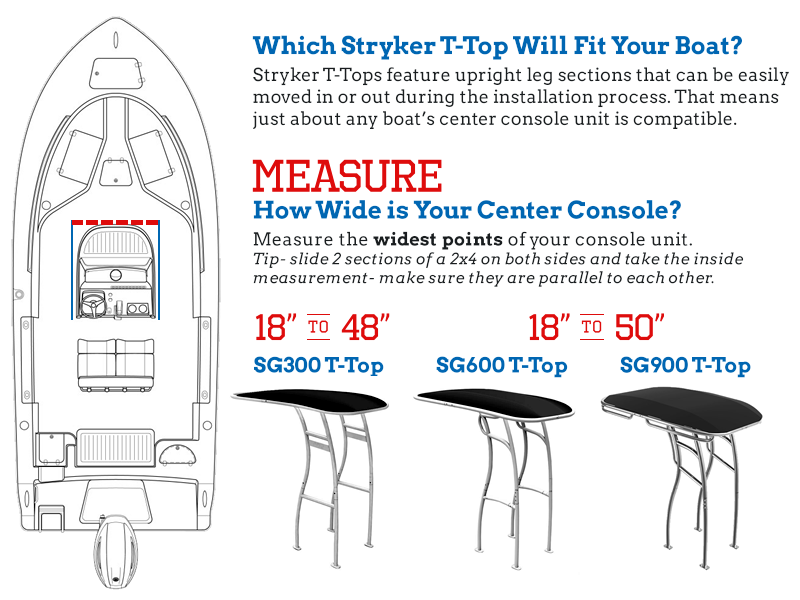 The SG900 is our latest flagship model and is our strongest aftermarket t-top ever! We have carefully designed the SG900 with thicker tubing, tons of welded on grab handles and stylish lines. Unlike all our others models, the SG900's upright leg sections have been upgraded to a 2.5" diameter! The top hoop section for the canopy is still still 2" diameter and is compatible with our full range of t-top accessories. All SG900 t-top are powder coated using the premium brand Interpon by AkzoNobel for the very best in great looks, longevity, and protection. Available colors are white, black and the new QuickSilver which is a perfect match to anodized aluminum. Our t-top are "universal" meaning the upright leg sections can be moved in or out to snugly fit the dimensions of your center console unit. Completing the install with the massive solid aluminum top clamps and included side supporting stand offs, you will have a rock solid, beefy t-top structure with no sway, wiggle or rattle. 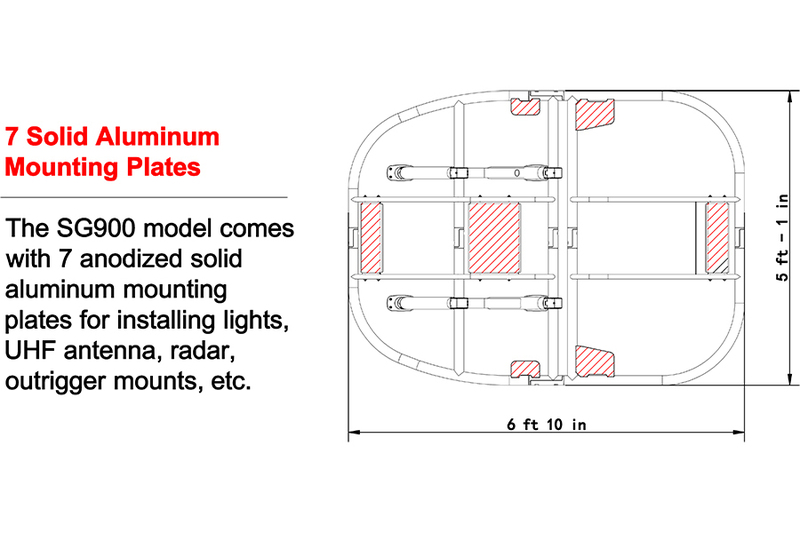 Mount all your favorite outrigger gear, lights, antenna, radar or whatever you wan to any of the 7 solid aluminum mounting plates. 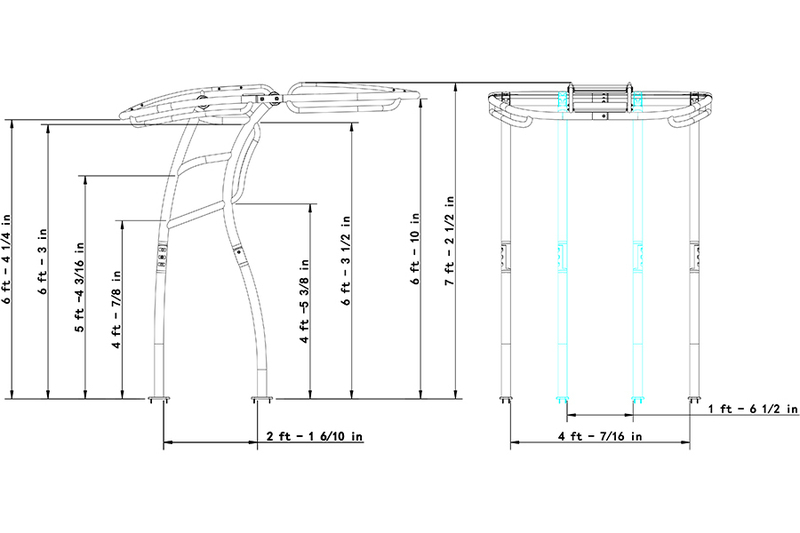 Includes 4 standoffs in anodized aluminum are included for increased stability and can be sized for any installation. Looking to take your t-top to the next level? Stryker manufacturers a full line of accessories including an electronics box, rod holders, rocket launchers, antenna mounts, navigation lights and so much more. No matter what level of sports fishing you're at and regardless of what you fish for, we have everything you need to customize your t-top with affordable t-top accessories. Overall Height: 7' - 2.5"
Minimum Frame Width 1' - 6.5"
Maximum Frame Width 4' - 7/16"
Very happy with the new SG900. Solid T-TOP! Great T top for the money, easy to install, overall engineering is superior. Powder coating is very nice. Only 2 issues: The front leg pads didn't match my deck, a small shim solved this issue. #2 VHF antenna mounts welded at 25-30 degrees. Overall a great purchase, would buy again without hesitation!